Also those icons does SteamVR just natively support Pimax and Nolo gear now? It's possible Driver4VR is doing that even though i don't run it, it seems to run itself on SteamVR launch so it might be injecting somehow? also does it when running Piplay and/or the Nolo app. Everything i currently have: pimax 4k, Nolo VR, Leap Motion, 360 kinect, Raspberry Pi 3 and a Cocoon Create 3D printer. Could i have the Pimax, Nolo head tracker and Leap routed into some kind of hub like a Raspberry Pi? I need some help figuring out how best to route cables over the center of my head so I'm not so weighed down on one side. Would a kinect setup behind me help with overall tracking? I'm guessing theres no way for the kinect to detect and help positionally track the controllers/headset since its more a basic skeleton tracker. but its the more hardware side of somehow routing everything via some kind of hub that I'm stuck on. Anyone have suggestions on what i could do? I'd like to do things cheaply and I'm not afraid to spend time ghetto modding things but should i just buy more lighthouses? i can't find Nolos ones sold individually though. Get 1 or 2 Vive/Rift lighthouses for 3rd party software to handle combined tracking if that'd even work? Go the mocap route with kinects? Any and all suggestions greatly welcomed. 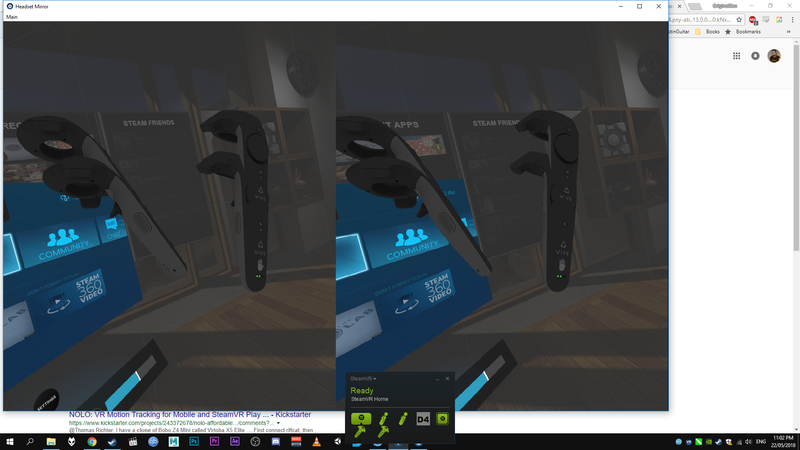 As for multiple controllers shown in SteamVR, please make sure NOLO driver is closed while using Pimax headset, so it will be 'Pimax + NOLO devices + Piplay' combo running while playing.